Adios, Top Gun: The End of the Fighter Jet? Maverick and Goose would be terribly unhappy with this new CSBA study. 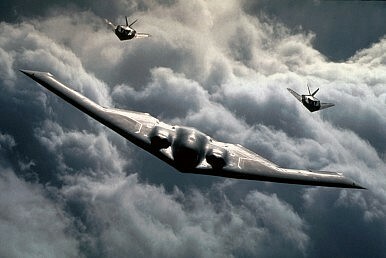 Is the old dichotomy between fighter jets and bombers becoming obsolete in air forces across the world? Yes, according to a new study, which argues small and highly maneuverable air-to-air combat planes may indeed be on their slow way out to be replaced by a new multi-role, stealthy, long-range aircraft the size of a bomber. “Aircraft performance attributes essential for success in air-to-air combat during the gun and early missile eras such as high speed, good acceleration, and maneuverability are much less useful now that aircraft can be detected and engaged from dozens of miles away,” according to John Stillion, who is a former U.S. Air Force officer and a fellow at the Center for Budgetary and Strategic Assessments. The paper notes that superior situational awareness (SA) still holds the key to victory in aerial combat. “The building blocks, however, of superior SA, information acquisition and information denial, seem to be increasingly associated with sensors, signature reduction, and networks,” Stillion argues in the study. “Looking forward, these changes have greatly increased the proportion of BVR [beyond visual range] engagements and likely reduced the utility of traditional fighter aircraft attributes, such as speed and maneuverability, in aerial combat,” he continues. The increased importance of electronic sensors, signature reduction, RF [radio frequency] and IR [infra-red] countermeasures and robust LOS networks in building dominant SA [situational awareness], and the potential reduced tactical utility of high speed and maneuverability could mean that, for the first time, the aerial combat lethality of large combat aircraft may be competitive or even superior to more traditional fighter aircraft designs emphasizing speed and maneuverability. [I]t is possible that the desirable attributes of future air-to-air platforms may be converging with those of long-range ISR/strike platforms, or that at least large aircraft with good low observable (LO) characteristics may be able to give a good account of themselves in aerial combat. If this is true, then a sixth-generation “fighter” may have a platform that is similar to a future “bomber” and may even be a modified version of a bomber airframe or the same aircraft with its payload optimized for the air-to-air mission. Why invest in the sixth generation fighter to create a ‘super F-22′? Such an aircraft will only offer marginal improvements over the F-22 at great cost. But it will still be fairly short-ranged (at least considering the operational distances in the Pacific and other theaters). Wouldn’t it be better instead to focus on a bigger aircraft? Perhaps the new long-range strike bomber (LRS-B) program (see: “What Do We Know About the US Air Force’s New Bomber?”) could be the nucleus of such a future force. The design and capabilities of the new bomber remain unknown, outside of some obvious characteristics: the bomber is purported to have stealth capability, to carry both conventional and nuclear weapons, and will, in all likelihood, be optionally manned. Pentagon Awards Contract for US Air Force’s New Top-Secret Bomber US Air Force’s New Top-Secret Bomber Faces Further DelaysWill the US Air Force’s Top-Secret Bomber Cost $3 Billion Per Plane? US Air Force’s Top-Secret Bomber More Expensive Than ThoughtWhat Do We Know About the US Air Force’s New Bomber?